Please vote for LaVerne Biel for Spokane City Council District 2. Today is the BIG DAY! Election results begin to be reported starting at around 8:00 PM, and we will be watching them post in real-time at our Election Night Party at South Perry Pizza. If you’re looking for a great time with great eats, while you wait to see if we won, then come on by! If you have not already cast your ballot, please note that in order for your vote to count, you must either have your ballot post-marked TODAY if sending through mail, or inside one of the area drop box locations before 8:00 PM this evening. We have made great strides meeting as many voters as possible face-to-face, or by phone – but it’s impossible to reach everyone within the district by these means. Our television ads are meant to introduce voters to our campaign and LaVerne’s platform. Unfortunately unlike door-to-door or phone-banking, television advertising isn’t free. In order for us to continue utilizing this medium to get our message out, we need your continued support. Please consider donating today. Have You Run Into LaVerne Yet? LaVerne and her campaign have been hard at work in these final remaining days prior to the election. Whether it be at your doorstep, on the phone, via facebook, twitter, or on television; LaVerne has been everywhere, engaging with the community she is running to locally represent. In total, LaVerne has canvassed 42 of our 50 precincts, personally meeting voters face-to-face at their door. This adds upto over 37,481 doors knocked by LaVerne and her campaign team! On top of doors, LaVerne and her campaign have made over 2,800 calls to remind voters to cast their ballots before next Tuesday. Considering LaVerne is in the phone system business by profession, LaVerne is very proficient in utilizing this technology to keep voters informed. If you would like to join LaVerne and her campaign in getting her message out, please email us and we’ll let you know what opportunities are available, whether it be door-to-door canvassing, phone-banking, or sign-waving. Only 5 Days to Election! The final week to return your ballot in order for it to count has arrived. Given we are in a non-presidential year, turnout is projected to be relatively low – this means every single vote will make a BIG difference. In these final days, the usual mud-slinging has surfaced from our opponent. Her false attacks show that their campaign is desperate to diminish our grassroots-based community-oriented message of returning Spokane city council back to the basics of their mission statement – “To deliver efficient and effective services that facilitate economic opportunity and enhance quality of life.” This means Spokane should be focusing on the right things, such as public safety and long term private job creation. We fulfill this by building sustainable communities with a commitment to service. LaVerne has never held office or been involved in politics. LaVerne is a member of the East Central Community Center (ECCC) Board. While the ECCC struggled briefly after the separation from the City of Spokane, those issues were overcome. Today, the ECCC is thriving with participation from the whole community. LaVerne and Kent Biel have offered paid sick leave to their employees since 1998. LaVerne believes that the discussion on mandatory paid sick leave is a federal or state issue, not the city’s. LaVerne has no knowledge of any special interest groups that donated out-of-town money to her campaign. Throughout her campaign, she has run on her own platform and is not dependent on outside sources to get her message out. LaVerne supports our existing public safety measures for police and fire safety. Click on the image below to watch our new campaign video. 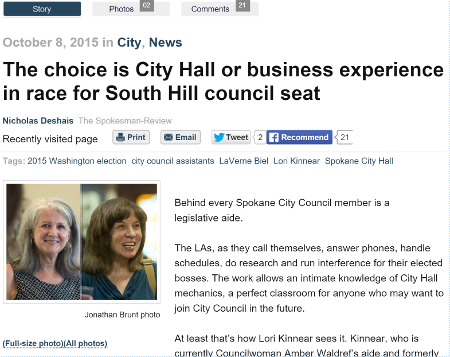 The Spokesman-Review has chosen to endorse LaVerne Biel for Spokane City Council District 2 for the General Election. Remember – Ballots begin to arrive starting Wednesday! October has seen a steady ramp-up in activity for our campaign, from debates, to canvassing, to participating in festivals, to interviews. Now the exciting reality that ballots will be dropping in just a few short days! Please check your mailbox on Wednesday, October 14th for YOUR ballot! In Thursday’s Spokesman Review, Nicholas Deshais published a well written article clearly describing the difference between LaVerne and her opponent’s philosophy of the position they’re seeking, and how their backgrounds would impact the way they would govern. Any contributions are gladly welcomed. Thank you very much for your generosity.